Multi-purpose product for normal & oily skin. Our handcrafted, naturally-derived, biodegradable Rosemary Liquid Hand/Body wash is a multi purpose product that will exfoliate, cleanse & moisturise in one action. It can also be used as a multipurpose cleaner in the bathroom, shower and on almost all surfaces. 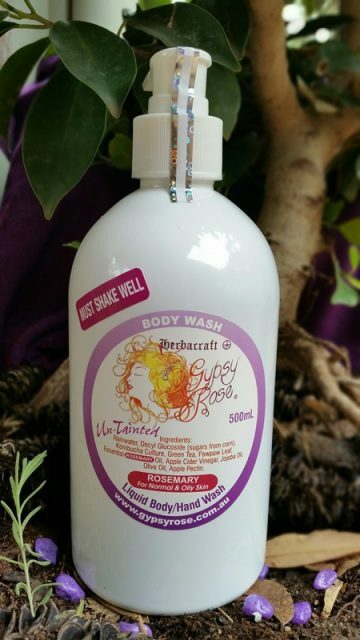 Body wash for normal & oily skin. Multi purpose product, exfoliates, cleanses & moisturises in one action. Our handcrafted, naturally-derived, biodegradable Rosemary Body wash is a multi purpose product that will exfoliate, cleanse & moisturise in one action. Furthermore it can also be used as a multipurpose cleaner in the bathroom. Due to its ingredients this includes giving glass in the shower an instant clean. Most of all it has been tried successfully on almost all surfaces. Enriched with skin-loving ingredients, Gypsy Rose Australia’s chemical-free Rosemary Body Wash cleanses without stripping moisture. Most of all, leaving your skin incredibly refreshed, soft, healthy and glowing. Its also free from petrochemicals, parabens, mineral oils, silicons and sulfates. 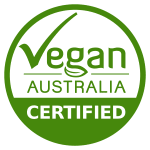 What’s more it’s also vegan friendly, not tested on animals and made in Australia. It is a beautiful mate to our All Rounder body top to toe product. PLEASE NOTE: This product is not suitable for use as a shampoo. It is a different formulation to our 2 in 1 shampoo, due to different amounts of the same ingredients used. The astringent properties of rosemary essential oil make it beneficial for general skin care. Whilst the herb Rosemary contains a wide array of nutrients such as iron, calcium, vitamins and antioxidants. The oil form, furthermore can work to rejuvenate and rehydrate the skin keeping it taut and healthy. Rosemary essential oil is widely known mostly for its powerful antiseptic and disinfectant properties. These properties may also help the appearance of acne and T-Zone skin on the body and face . Especially revelant in the right formulation, its known to have a positive effect on reducing the slick look of oily skin. PLEASE NOTE: Please allow a 2 week trial to allow the Rosemary Body Wash to improve and fully revitalise your skin’s condition. Apply 1 squirt directly onto a large section of the body. Massage gently. Please note: the product will lather with a body brush but not with your hand, it will still clean thoroughly and effectively. It is really important to shake the bottle from side to side before use to release the sediment which settles on the bottom. BUT be aware, if you shake too hard the product may burst out when you open the pump.